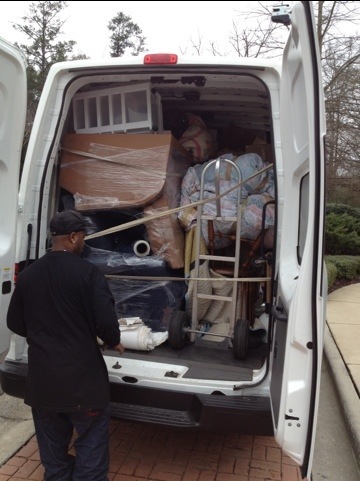 This is a Nissan NV3500 we used for an Assisted Living move from Birmingham, AL to Woodstock. 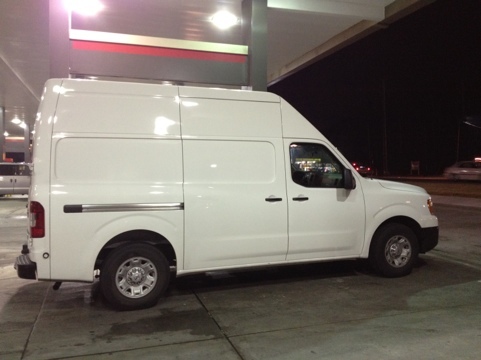 It has 9′ of cargo space behind the door, and it’s “high cube” is 74″ high so you can stand up in it. We also stood up a full size mattress and box spring “in a tier” which is very helpful in maximizing the load. We got about 1800 lbs in there including the moving equipment. The great thing is it gets 23 mpg gas as opposed to say an Isuzu with a 16′ box which only gets 10.5 mpg diesel. In this posting we will discuss the second variable, “Access Issues.” How easy is it to get to the furniture at the Origin and how easy is it to deliver it at the Destination? A) Will the truck park on the street or in the driveway? B) If on the driveway, is it flat, circular, declined, inclined, or too steep for the truck? C) If on the street, is it a small side street or a busy boulevard? Just try parking on Clairmont Rd. (busy street in Atlanta). Moving trucks get $150 parking tickets when they park on busy streets in downtown Atlanta to do high-rise moves. D) Is there a Loading Dock? If so, then the items will come out of the truck quickly, but there is probably a long walk to the residential unit and there are probably elevators involved. The movers will need 12 to 30 of the 4-wheel dollies in order to efficiently roll the items being moved. E) Is there a parking structure? If so, the truck is most likely too tall for the entrance and will have to park outside the parking structure. There will most likely be a long walk to the elevator, and again, the mover will need 12 to 30 of the 4-wheel dollies. F) In extreme cases, the roads themselves leading up to the house may be impassable by the Moving truck. There are mountain towns like “Big Canoe” in Georgia where many of the town’s roads are impassable by tractor trailers. In Big Canoe, there are places where even standard 24’ box-trucks need to be in either 2nd gear—if a standard transmission—or the lowest gear if an automatic transmission. Once you get to the mailbox, there may be a steep winding driveway which now requires a still smaller vehicle—like a 14’ shuttle truck or even a van—the size of an electrician’s van. A) How many feet, or how many car-lengths—of a standard-size sedan like a Camry? B) Is the walk level, up, or down? C) Over what type of terrain? If asphalt or concrete, then four-wheel dollies and handtrucks can roll smoothly over it. But if the walk is through a yard, If it is through grass, or dirt, or gravel then rolling a four-wheel dolly or handtruck may be impossible. 3) Are there Stairs or an Elevator? A) If stairs? What kind, and how many? Up or down? iii) Stairs can be narrow and have switch-back turns which are difficult to navigate with large furniture like sofas and armoires. iv) Staircases may have low overheads, especially in low townhouses, where a Queen-sized box spring will not fit up the stairs. B) If there is an elevator, what are its limitations? i) Is it a freight elevator which you can reserve and dedicate for your move? A) Front Door: Double or Single-Door? Narrow or Wide Door? “Straight-Shot” in or is there a tight right-angle turn to get in the door. Once you get inside the door, is the staircase in the way? B) What is the Floor Like Going in the Door? i) Real hardwood? Light or Dark? Light shows the scratches more and is more difficult to touch-up or repair? ii) laminate? Less sensitive, and easier to repair, but dents more easily. iii) Carpet? Light or Dark? How new? How easily does it tear? C) Doorways Inside: Are they narrow? Will the refrigerator’s door need to be taken off in order to get through the doorway, or will the refrigerator have to be put on a four-wheel dolly, and then one-door opened and maneuvered through the doorway with the door open? D) How Many Levels? One level, two, three, or four? E) How many rooms are there? and how big is the house (how many square feet?) The size of the house will greatly effect the amount of time it takes to do a move, and this is independent of the total pounds on the load. For a load of 7200 lbs of household goods, a crew may be able to move it at a rate of 700 lbs per man per hour when it comes out of a first floor, two-bedroom apartment. When the same load comes out of a 6 bedroom, 8000 square foot house, the crew may only be able to move it at a rate of 425 lbs per man per hour! 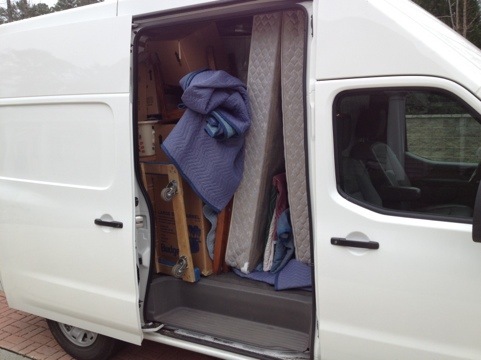 After I survey your client’s home, or office to be moved, I Design a Move for them based on what I call the “Hard Factors” and the “Soft Factors.” Hard Factors are quantitative and involve the inanimate realities such as the furniture, boxes, crates and access issues at the origin and destination. From these raw variables I determine the number of total man-hours required, and what will be the best mix of trucks and Moving Equipment. 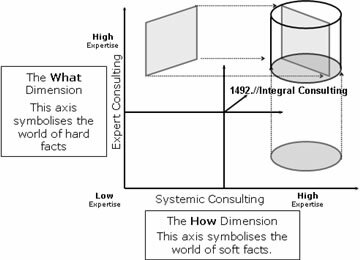 The “Soft Factors” are human factors: I have general questions such as: What is the customer like? Emotional Type “A” or Type“B”? How did they find out about us? What is their experience with Movers? What are their expectations from the Movers? And then more specifically: Is the scheduled move contingent on a Closing or Closings? Are they more worried about their money, their furniture, their time, having to do tedious physical work themselves, or something else? Based on the hard and soft factors for your client’s specific case, I design the most efficient and ultimately satisfying move for them.